Heat your oil to 350°F. Use a deep fry thermometre to make sure it's the right temperature. Slice pickles thinly longwise. You should get 5 or 6 slices from one pickle. Place pickles on a paper towel to dry out a bit. Mix batter ingredients together. If you want a thinner batter, add a bit more beer. Also, if you want a softer batter, use milk instead of beer. 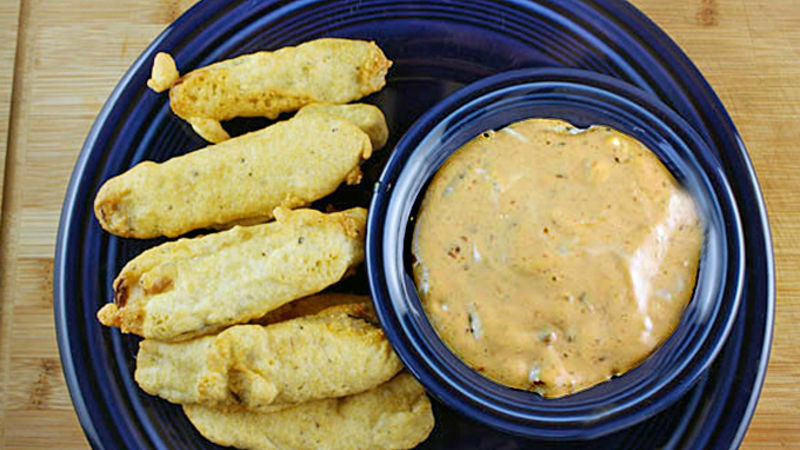 Dust pickles with flour and then dredge in batter. Fry pickles for about 5-6 minutes until they are golden brown. For dipping sauce, process chipotle peppers and mayo until mostly smooth. Remove pickles from fryer and let drain on a paper towel. Serve pickles with spicy mayo! For this appetizer, try to find really crunchy pickles, like the kind found in the refrigerated section of the grocery store. They tend to be a bit crunchier. For serving size, assume about a pickle per person, but there's enough batter in this recipe to make probably 8-10 pickles. Slice the pickles as thinly as possible, lengthwise. It makes it easier to dip them.